Will PubPlus Save Content Sites? "We Can Tell Anyone If It Was Worth Spending The Money"
The internet has been part of our lives for 30 years now – but traditional content companies have not yet found the best way through this world. Most publishers battle for their lives in the digital age, using two leading strategies: harnessing as many readers as possible to the site so that they’ll watch ads, a strategy called “Eyeballs” in the industry, or operating a payment wall on content sites. The first strategy turns the sites into a traffic flytrap, which leads to compromise regarding the quality of content and headlines. The second strategy requires market education – users must be persuaded to pay for content on the internet that is currently provided at no cost – and that is no simple matter. In this reality, an entire industry of startup companies has developed, such as Taboola and Outbrain that are trying to save publishers by offering content recommendations to increase browsing volume on their sites – or companies such as Playbuzz and Apester, who want to increase user involvement in content and by so doing, to keep them for as long as possible on the page. However, all these are rearguard wars. An Israeli startup by the name of PubPlus, which we are exposing here for the first time, offers publishers a new service. The company, which was founded in 2016 by Gil Bar-Tur (then 26 years old) claims that they can measure the value of users and they promise to increase the profit (not only income) of content sites. 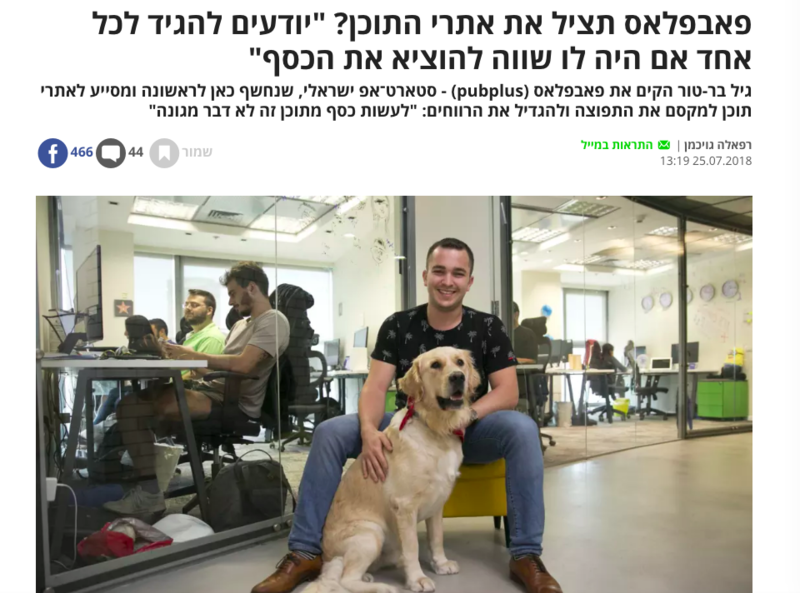 PubPlus already has 52 workers and is an exception in the startup market, because among other things, it has not raised a single shekel from venture capital funds, and it is what is called a bootstrap – a company that has financed itself from day one. And there is another exception – PubPlus lives according to the profit-sharing model. It offers news sites a deal like this: “Give us some of the profit that we’ll create – and no more.” Today, the company has already reached revenues of 100 million dollars a year. The development that PubPlus offers for content sites is a platform that analyzes the performance of the site for them, and the articles that came up in real time – and so they can understand how much money each content page makes for them. “We produce maps for sites in real time, and we can tell each one if it was worth spending the money they spent on promoting a specific article or not,” Bar-Tur explains. Bar-Tur served in the IDF as an officer in the Center of Encryption and Information Safety. After his discharge from the army, he worked for several years at General Electric’s cyber center, and in 2014, he founded Crunchmind, the first incarnation of PubPlus, which specialized in building content sites. According to estimates by the media company Zenith, global spending on online advertising in 2018 will reach 227 billion dollars. This is a huge sum that should be supporting all existing content sites, but in practice two giant companies – Google and Facebook – collect half the revenue for online advertising. The two have become an advertising duopoly, because they have built platforms that offer billions of visitors around the world a different content consumption experience, and they’re based on content produced by other companies – mainly news and entertainment creators. In order to maximize the distribution of their content, sites are now buying “traffic” to articles, especially from Facebook, using the Boost button – a button that moves an article up to a business page on the social network and enables quick promotion of a post for payment. By so doing, the PubPlus platform turns content creators into advertisers too. It allows content creators to learn what their leading content is, to turn it into a campaign, promote it and make more money from it. The technology also knows how to indicate to the site owner which campaign isn’t profitable, so that he can stop injecting money into it and save the unnecessary expense. “We can show the content body which article works best for it, and then tell it that its worthwhile to show it to more users – to run it as a funded campaign. We can promote it in a certain country and even adapt it to certain platforms – Yahoo, SnapChat, and so on – where it is presented differently on each. It isn’t a dirty word, to make money from content,” Bar-Tur claims. And how does PubPlus benefit from the tool they built? “We build profit-sharing deals, and the more the content body earns – so do we. If the content body only wants to increase the number of users, we’ll take a given percentage of the money they spend,” Bar-Tur says. Give us an example of insights into user behavior. “Women, for instance, click significantly more on articles showing women than men do. In addition, when we identify anomalies, we try to understand their source, to learn what has changed, what happened. We also share our insights with our customers. The idea is to build an index of different behaviors.